14 Jan : Makar Sankranti, Pongal and Magh Bihu are being celebrated with traditional fervour and gaiety across the country on Wednesday. The President, the Vice-President and the Prime Minister, have greeted the Nation on this auspicious occasion. Makar Sankranti: The starting of Uttarayana is celebrated as Makara Sankranti throughout India as it is one of the most auspicious days for the Hindus. On this day, hundreds of thousands of people take a dip in places like Ganga Sagar and Prayag(Allahabad) and pray to Sun God. Makara Sankranti (a Sanskrit word) is the harvest festival of India.Sankranti means transmigration of Sun from one Rashi(something akin to Zodiac) to the other. In Uttar Pradesh, large numbers of pilgrims have started reaching the Sangam, the confluence of the river Ganga, Yamuna and Mythical Saraswati to take dip in the holy waters on the occasion. Eleborate arrangements have been made for the Makar Sankranti, second bathing festival of world famous Magh Mela at Sangam.More than one dozen bathing Ghats have been developed on the banks of river Ganga and Sangam for the pilgrims to take bath. Considering terror threat a large numbers of security forces have been placed in and around Mela area.The Mela administration has set up at least forty barriers at several places to check the movements of dubious persons and unauthorized vehicles. The administration has also provided identity cards to all officers and employees and sailors, florists and priests in the Mela area.Pongal: Pongal is celebrated by all people in the South Indian states of Tamil Nadu and Kerela, to give thanks for the winter harvest. Charkarai Pongal cooked in new pots, vadai, Payasam and sugarcane are some of the compulsory menu in the houses.Women welcome the year with a beautiful kolam or rangoli in front of their houses. Palm leaf and mago leaf festoons are hung at the entrance of houses to add to the rustic touch for the festival.A host of dignitaries, including Union Ministers P Chidambaram, T R Baalu and Congress leader D Sudarsanam on Wednesday called on Tamil Nadu Chief Minister M Karunanidhi and greeted him on the occasion of Pongal Festival and Tamil New Year day. It was a special occasion for the Chief Minister, who declared this day, the first day of Tamil month "Thai" as the Tamil New year, fulfilling the long time aspirations of Tamils scholars. 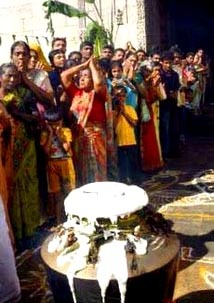 Bhogali Bihu: In Assam, people celebrate this day as ‘Bhogali Bihu’. Magh Bihu or Bhogali Bihu (derived from the word ‘Bhoga’ meaning eating or enjoyment) is celebrated when the harvesting is over.The festival marks the advent of the Asamese month of Magha. Maghi Melas are being organized across the State where traditionally-produced items are exhibited. Bulbul bird fighting of Hajo in Kamrup district and the Buffalo fighting in Nagaon district attract large numbers of people besides the tourists.Bihu brings communal harmony in the society. Despite price rise and some law and order problems, people from all walks of life are enthusiastically celebrating the festival. Security has been beefed up in all the vulnerable areas, including markets and public places in view of latest serial bomb explosions in the Guwahati city and other parts of the State. On the eve of Bihu day, called “Uruka”, women prepare rice cakes and other refreshments. The most significant part of this day is the building of ‘Meji’ and feasting at night. The whole night is spent in feasting, merry-making dancing and singing. Besides the above forms of celebrations, people specially in Gujarat not only look reverentially upto the sun, but also offers thousands of their colourful oblations in the form of beautiful kites all over the skyline.